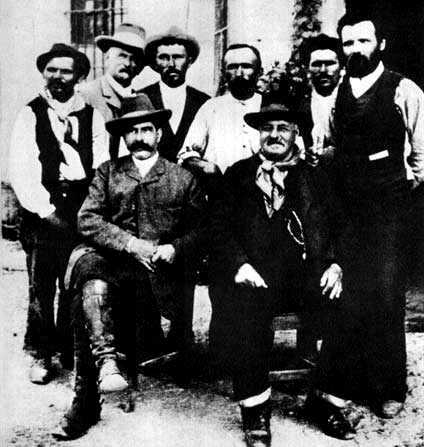 Giovanni Rossi (January 11, 1856 – 9 January 1943) was a Italian anarchist who founded the two cooperative communities of Cittadella (Italy) and La Cecilia (Brazil). By profession he was an agronomist and a veterinary doctor. He was the author of the book, “Un comune socialista”, which he published under the pseudonym of Cardias. Born in Pisa, Giovanni Rossi was influenced at an early age by the historical founders of anarchism such as Proudhon, Bakunin and Peter Kropotkin, and he was fascinated by utopian socialist and communitarian ideas such as those found in More’s “Utopia”, Campanella’s “City of the Sun”, and in the works of Charles Fourier, Etienne Cabet and Robert Owen. His anarchist ideas were positivist, and he conceived politics as being a scientific discipline. He studied agriculture and vetinary medicine at the University of Perugia, gaining his doctorate in 1874, and later worked in both of these professions. In 1873, he became a member of the Pisan section of the International Working Men’s Association (IWMA). In 1878, his first book, “Un comune socialista” was published under the pseudonym of Cardias, promoting his theory of how anarchist communities could be organised. His friendship with the insurrectionist anarchist, Andrea Costa, and his political activities brought him to the notice of the political police. Rossi was arrested in November 1878 for presumed anti-statist attacks, and he was held in jail for five months until April 1879, when the case was dropped. At the same time as his political work, he continued his activities as an agronomist and vetinary doctor, working in Montescudaio (Tuscany) and published a number of books. In 1882 he moved to Gavardo (Brescia) where he worked for some time as a vetinary doctor. With the hope of being able to put his ideas about cooperative communities to the test by starting such a project, he began to contact prominent members of the Italian libertarian left asking them for advice and support. However, he did not get any substantial help. In Brescia, in 1886, Rossi began publishing, with Andrea Costa, his newspaper “Lo Sperimentale” (The Experiment), advocating of the creation of cooperative colonies. In the same year, he was contacted by Giuseppe Mori, a follower of Mazzini, who wanted to found a community on his farm at Stagno Lombardo, near Cremona. Rossi’s first attempt at starting a community was on Mori’s 120 hectare farm of Cittadella, Stagno Lombardo. From November 1887, the land, machines and livestock were leased to an agricultural cooperative made up of the peasants who had previously been paid workers there. Rossi was elected secretary of the cooperative. At the agricultural level, it was successful enough to win a silver medal at the Paris Exposition of 1889. However, Rossi was not satisfied with the experiment. Although a far reaching collectivisation under self-management had taken place, the social relationships in the daily life of the cooperative members remained much as before. The peasants were reluctant to take the steps Rossi thought to necessary to achieve anarcho-communism. Rossi left the community at the end of 1889. The Cittadella cooperative was wound up in November, 1890. Rossi, Mori and members of Citadella, 1890.
for the children was open irregularly. “Instruction, music, theatre, dances, have still not been possible. The productive job has absorbed to us entirely “. In 1907, Rossi returned to Italy, researching agricultural problems, was employed as a veterinarian and teacher, continuing to favour libertarian cooperative colonies and was an advocate for the emancipation of women. By the 1920s and the start of the fascist period, he had more or less given up political activism, publicly only attending the funerals of his old comrades. With the onset of WWII he retired, living a withdrawn life, and died in his home town of Pisa in January 1943, at the age of 87. Giovanni Rossi, “Utopie und Experiment” Karin Kramer Verlag Berlin, 1979. ISBN 3-87956-057-9 Works by and about Giovanni Rossi, originally translated and published by Alfred Sanftleben, Zürich 1897. Giovanni Rossi in The Anarchist Encyclopedia A Gallery of Anti-Authoritarians & Poets, Saints & Sinners, Movements & Events.